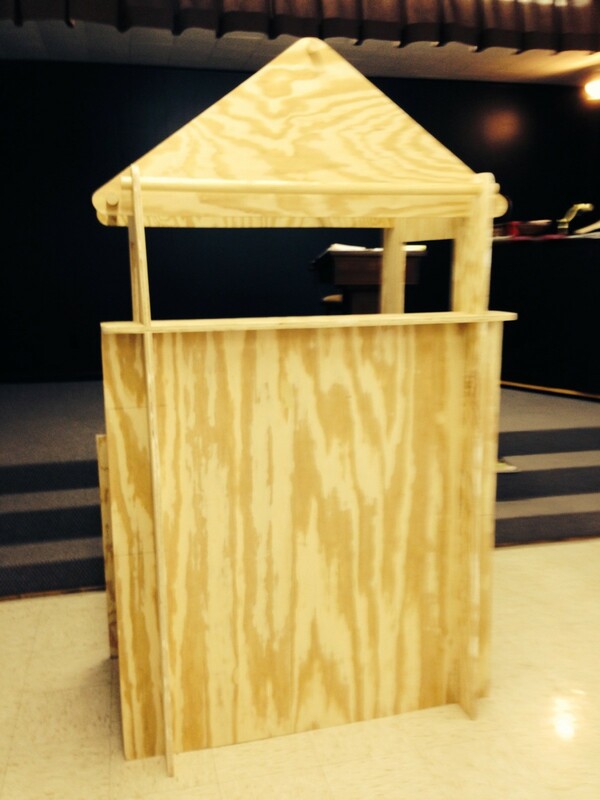 –Kudos to Don North and Larry Lindsey for the construction of the puppet theater to be used in Vacation Bible School. 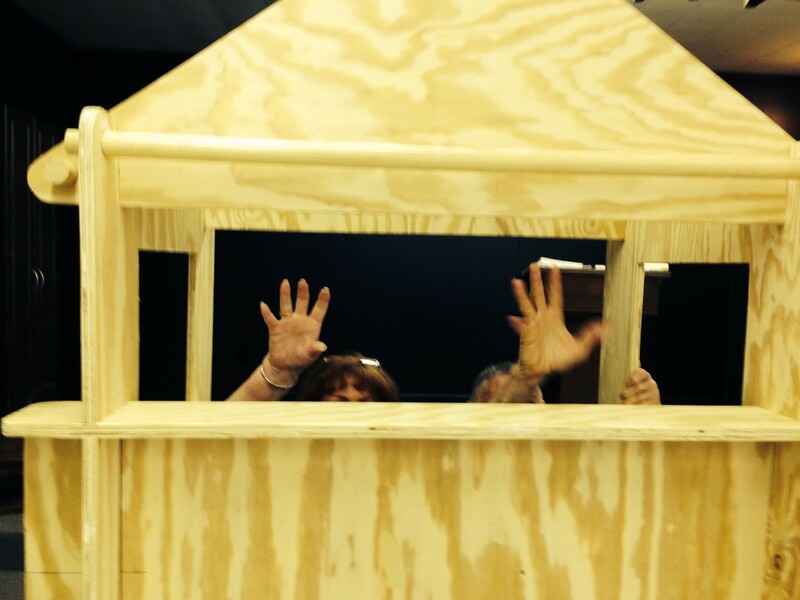 They worked tirelessly and diligently to create a theater that will allow the puppeteer to sit as they manipulate hand puppets for the opening and closing of each day at Vacation Bible School. –Picture #2 shows not one, not two, but three adults vying to demonstrate the use of the puppet stage. Cute!! –Obviously, the pictured theater will undergo a transformation when it is painted and curtains installed. Additional pictures will appear here on the blog when it’s finished. –Vacation Bible School will be held during the week of June 16-20, 2014 and everyone’s help is needed. Please prayerfully consider how and where you can help as we seek to spread God’s love and God’s Word to the children in our community. Jean Ann Whittington and Shirley Bynum, co-chairs of the Bake Sale portion of the UMW Rummage and Bake Sale await your donations of yummy baked goods and candies. Please bring your donations to the church on Thursday morning, March 6th. Members will be there to receive your items and arrange them for the sale on Friday. 1) Bundt cakes, layer cakes, or sheet cakes – any flavor, any kind. Make them full-sized or in loaf pans or mini loaf pans… our customers enjoy the variety and choice. 2) Cookies: ANY kind… cookies are one of the best sellers!! Chocolate Chip, Raisin oatmeal, Cranberry, Peanut Butter, Snickerdoodles, Gingersnaps, Pecan tasties, and so on. If possible, they can be packaged in half dozen quanities in a ziplock baggie. Customers enjoy getting a baggie and munching as they browse the rest of the sale items. But the cookies will be accepted in a box or bag of several dozen as well. 3) Breads: Quick breads and/or yeast breads, muffins and cinnamon rolls are always good to bake. Any kind of bread seems to be a hot-ticket item early on. The yeast breads never make it past 10:00 a.m. on Friday. (So come early if you plan to purchase some. 4) Pies: People do LOVE pecan pies but any type of pie is a good seller: cherry, blueberry, apple, etc… and don’t forget mini-pies are a good munching treat. 5) Candy and fudge: All candy… peanut patties, fudge, chocolate dipped fruit, you name it, we’ll take it! 6) The co-chairs respectfully ask that you suggest a price for your treats for sale. You are aware of the ingredients in the items and may have a better price suggestion than others might. Regardless, bring your donations to the church Thursday. The proceeds of this fund raiser go to various mission projects UMW supports locally, nationally, and globally. Items for the Bake / Candy Sale should be brought to the church on Thursday, March 6. UMW thanks everyone who is able to donate items for the rummage sale as well as for the bake sale tables. UMW members and workers busy organizing and pricing items for the Annual Rummage and Bake sale. Come early for the best bargains and yummy baked goods. 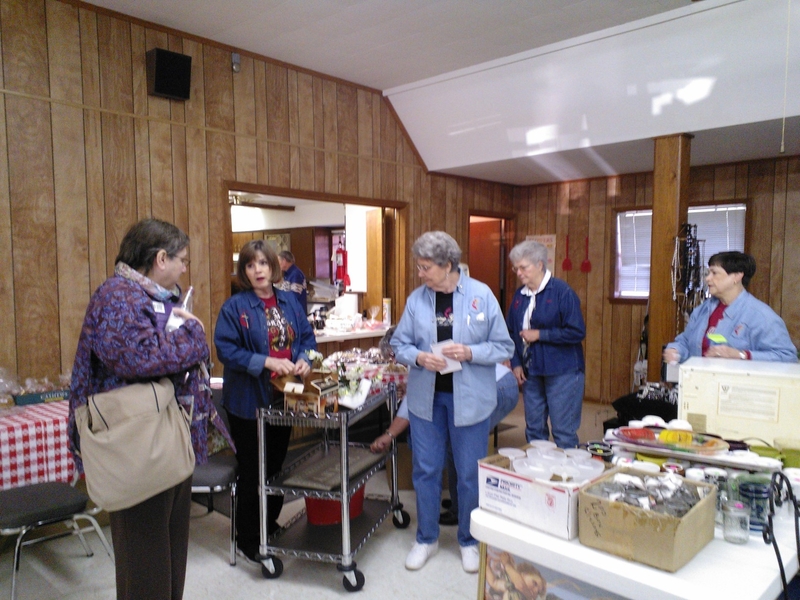 The United Methodist Women are getting everything ready for their annual Rummage and Bake Sale on Friday, March 7 and Saturday, March 8. UMW welcomes donations of your useable hand-me-downs, your castoffs, your down-sizing of your closet and kitchen items, books, holiday decorations, and so on. UMW welcomes all the “stuff” in the garage and the store room and even the boat shed – once that is cleaned out and items cleaned up. So encourage everyone in your household to clean those closets, straighten those drawers, eliminate the extra tools and fishing lures… you get the picture. Donations will be accepted the first week of March beginning on Monday, March 3 at 10 a.m. thru noon, Thursday, March 6. UMW members will be on hand to accept and price your donations. A big portion of this fun event is the Bake Sale. Methodist women (and some men) are known far and wide for their outstanding prowess in the kitchen. Cakes, pies, breads, cookies, and candy will be available for purchase. These items make perfect gifts for someone special, a terrific dessert for dinner, and they usually can be frozen for a last minute dessert for 2nd Sunday. But plan to come early as the bake sale table is the busiest table on Friday morning and the best goodies go fast. All baked goods should be brought to the workday on Thursday, March 6. Bakers/ Candy makers are encouraged to list a price for their treats as they are aware of the total cost of the ingredients. Bakers are encouraged to package a half-dozen cookies in ziplock baggies, if possible. Candies and small loaves of cakes or breads can also be donated as well as full size cakes and loaves of quick breads. Anything portable and yummy, and not requiring refrigeration is WELCOME!! Questions? 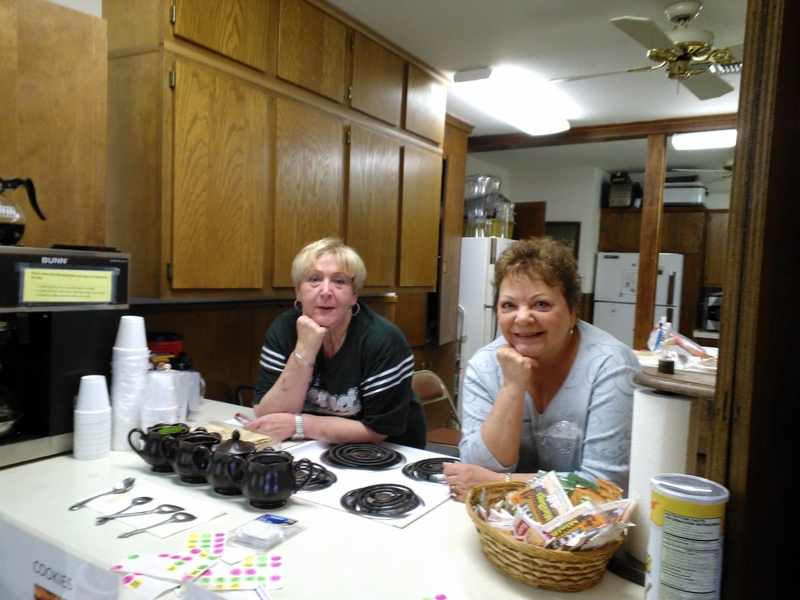 Check with Jean Ann Whittington or Shirley Bynum, co-chairs of the Bake Sale portion. Dates are Friday and Saturday, March 7 & 8. Times on Friday are 8 a.m.– 4 p.m. Saturday times are 8 a.m. – 12 noon. See you there! You are currently browsing the fumc hemphill blog blog archives for February, 2014.